ISLAMABAD, Pakistan (CNN) -- The mother of an American humanitarian worker kidnapped in Pakistan has pleaded for him to be freed in an audio recording released by the United Nations. 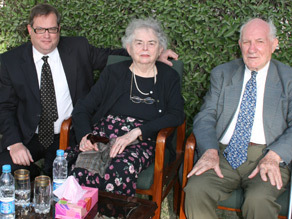 John Solecki is pictured with his parents Rose and Ralph during their visit to Quetta in April 2008. "My name is Rose Solecki. The UNHCR worker who went missing in Quetta, John Solecki, is my son. I am appealing to the people of Balochistan for whatever support they can provide to secure my son's safety and freedom. John is a very gentle person. He loves his humanitarian work, helping the people in need together with the people of Balochistan. His interest and respect for different cultures and peoples in the region perhaps was formed when he was a child. "My husband and I are archaeologists and we used to take John and his brother Bill with us throughout the Middle East and Asian countries ever since they were small boys. John then chose to return to the region to help the people there. I myself lived and worked in Balochistan a long, long time ago as a young archaeologist. When John took up his assignment in Quetta, his father and I were delighted. "I am 83 years old and John's father is 91, but we managed to make the long trip last year to see John in Quetta. We had such a pleasant visit and I was so excited to revisit the region after some 50 years. I cannot express how happy we were to have the opportunity to get to know again the people of Balochistan, this time through John. "John told us about how he enjoyed working on a kite project for the children of both Pakistan and and Afghanistan. He told us about his meetings with tribal leaders with much respect and the challenges he encountered helping people affected by flood and earthquake. I was so proud of John and the work he was doing with such dedication. My husband and I spent a wonderful time meeting his friends in Balochistan. "But this recent happy memory has quickly turned into a nightmare. I simply do not understand why this is happening to our dear John. He loves his job helping refugees and others in need in many difficult places in the world. Now I hear that John may be really sick and he needs medication. I cannot begin to explain the sorrows and pain I am going though right now. My husband and I are old. We want to be with John again. We cannot bear the thought of losing John. "To our friends in Balochistan, please help us find John and have have him return safely to his family, friends and colleagues. John has helped many people in Balochistan, and now my son needs your help. Thank you." CNN's Zein Basravi contributed to this report.